In our project, we will look at the force of the runner going up hill, down hill, and flat. We will also look at the velocity of the runner and how that affects force. Place the force plate approx. in the middle of the hill. Start running at the base of the hill and attempt to keep the same pace all the way to the top of the hill. Have another person video tape the runner on a digital camera / video camera. 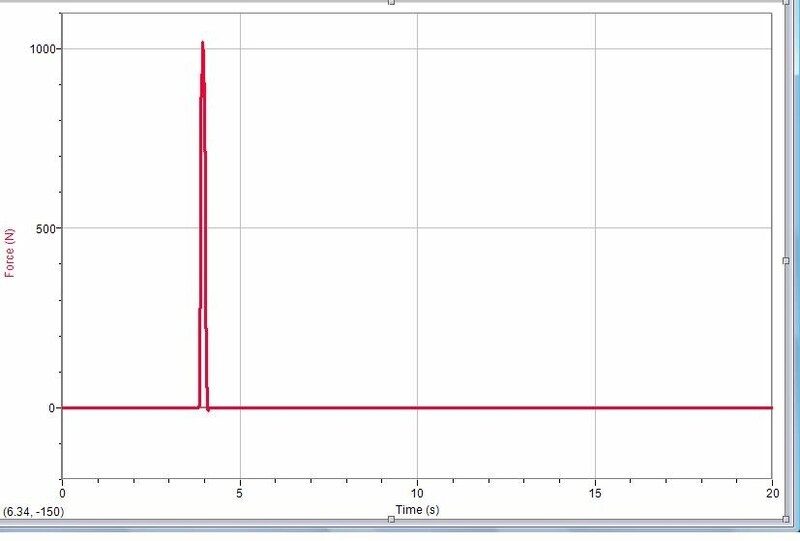 Use logger pro to make a displacement graph of the runner to determine if there is a constant velocity. Repeat same process except with runner starting at top of the hill and end at the base. Choose a flat area that is roughly the same distance as the hill. Place force plate in the center of the stretch. Repeat same process with video camera and Logger Pro. We did our physics of sports on running. We did uphill running, downhill running, and running on flat surfaces. We had the runners run on force plates uphill, downhill, and on flat surfaces as lab pro collected our data. We then used Logger Pro to analyze our data. We used Logger Pro to analyze our videos in order to find our acceleration, velocity, and momentum. We derived the velocity through inserting our movie into Logger Pro and using the point by point feature. We also found the acceleration for the uphill and downhill graphs by the slope of the graph. At first glance, we thought that the higher velocities yielded higher forces of impact in all cases. We discovered that we ran fastest while going downhill, which yielded a higher force of impact. At the same, when we ran uphill, our speed decreased when running uphill, which explained the lower force of impact. Yet when running on flat surfaces, the force of impact seemed to rely more heavily on the mass of the runner. The mass of the runner was a contending factor in all three cases. In our trials, the heavier runner ran slower, but had more force. This makes sense, considering force = mass x acceleration. Acceleration was highest going downhill, and lowest going uphill, considering going downhill gravity is working with the runner and uphill it isn't. This is why overall, forces going downhill were larger, since the runner had a greater acceleration. Velocities depended more on the abilities of the runner, but its easier to run faster going downhill. Through this we concluded that force depends not only on the incline being ran on, but the mass of the runner too. In almost all cases, except for one downhill trial, the heavier runner had a higher acceleration. 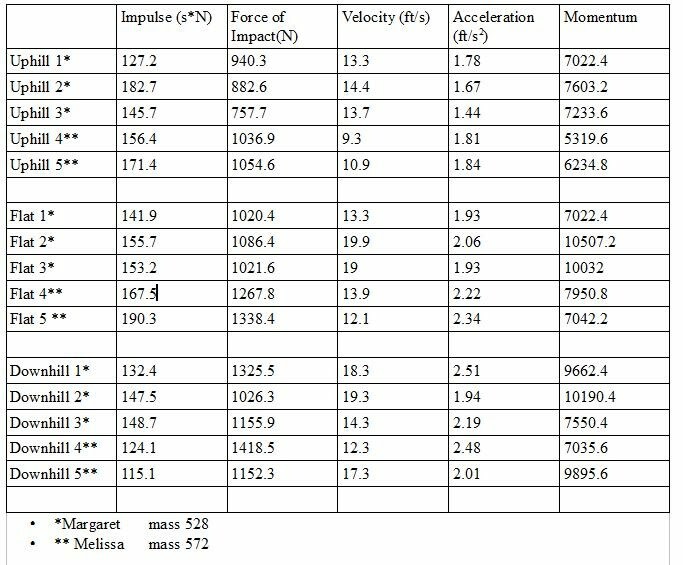 Again, this contributes to the heavier runner having greater force, since, as said before, force = mass x acceleration. Another aspect we looked at while analyzing our data was the impulse of each runner in each trial. Although no obvious trend was able to be found, we were able to notice that the impulse was lower while running downhill than in any other trial. We hypothesize that this may be because the runner is moving at a higher velocity and spends less time on the force plate. At first glance, we were unable to see any relationship with momentum and the rest of our data. This is because the numbers don't change as dramatically as numbers in other categories, such as force and impulse. However, once we looked more into it, we realized that that's because momentum is equal to mass times velocity. Since the mass is a constant and the velocities do not undergo dramatic changes from trial to trial and incline to incline, we do not experience much change in the momentum. 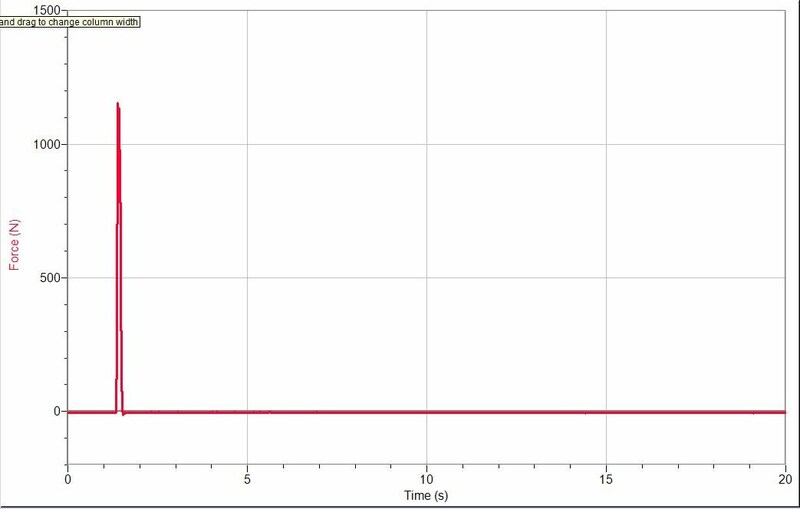 ^This is an example of a graph of the force exerted by a runner while going downhill. 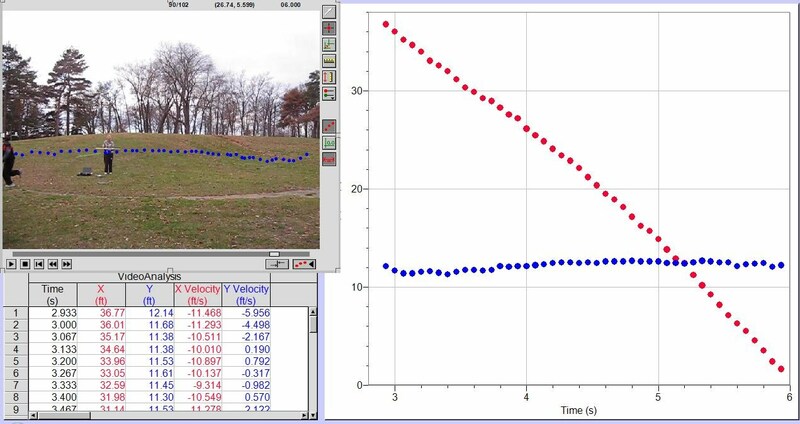 Notice how high the spike is (which represents the force exerted by the runner) compared to the image below which shows a the same runner going uphill. Also, note that the spike is narrower than that of the graph below. Generally, a narrower spike means a lower impulse. 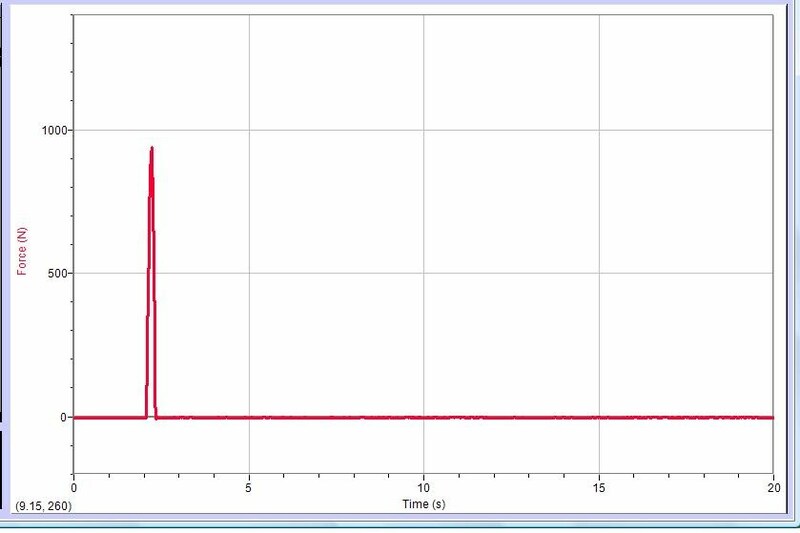 This uphill graph shows a higher impulse (which is the area under the spike) and a lower force. We hypothesize that this is because the runner has a slower velocity while running uphill, which would result in a lower force and therefore the runner spends more time on the force plate, which results in a higher impulse. Looking at this graph, we see that it also has a significantly large force. However, the impulse is lower than that of any other flat trial. We were unable to find any consistent trends in the flat trials.